As the CEO of Google, Sundar Pichai must be a busy man, but even he found time to reply to a 7-year-old girl’s adorable letter seeking a job at the company. 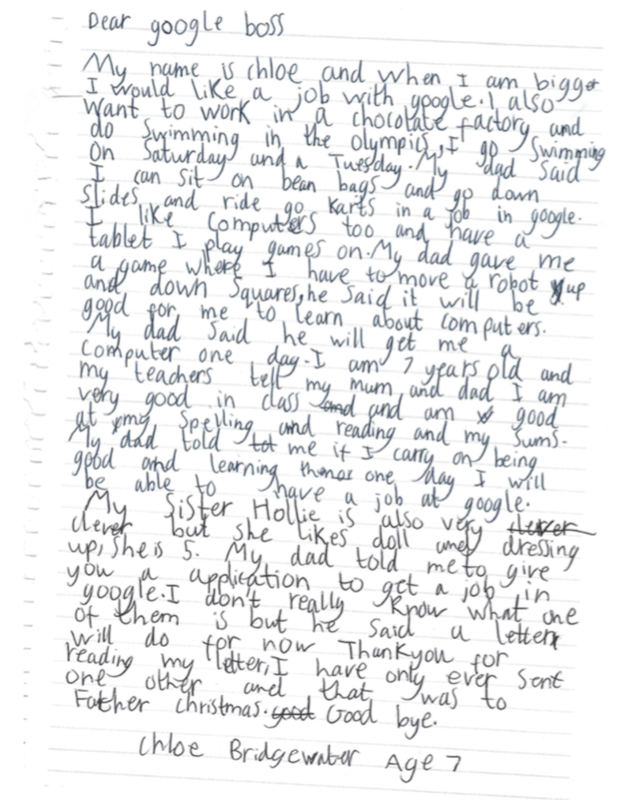 The girl, UK resident Chloe Bridgewater, had written to “the Google boss” Sundar Pichai telling him that she would like a job at the Internet giant when she is older. In his reply, Sundar Pichai wrote words of encouragement and motivation to the Bridgewater, and advised her to “keep working hard and follow her dreams” and to formally apply to Google when she’s finished with school. Bridgewater’s letter was handwritten directed to ‘the Google Boss’, upon the encouragement of her father. Business Insider reports that Chloe became interested in Google recently when she asked her dad, Andy Bridgewater, of the ideal place to work. He told her that Google would be ideal as it’s known for its ‘world-famous perks and cutting-edge work.’ Furthermore, she learned that the office had bean bag chairs, go karts, and slides, things that no doubt added to her intrigue. As her interest in Google peaked, she told her dad she wanted to work at Google someday, and her dad egged her on to start early. He told her to write a job application, and she did so, in her own carefree way. In her letter to Sundar Pichai, she wrote that she liked computers, robots, and tablets, and was a good student in school. Apart from working at Google, she also wants to work at a chocolate factory and swim at the Olympics. She added that the only other letter she wrote was to Father Christmas. You can read Chloe Bridgewater’s letter Sundar Pichai below. Google CEO Sundar Pichai responded by saying that he hoped that she would continue to work hard and follow her dreams. “Thank you so much for your letter. I’m glad that you like robots and computers, and hope that you will continue to learn about technology. I think that if you keep working hard and following your dreams, you can accomplish everything that you set your mind to – from working at Google to swimming in the Olympics. I look forward to receiving your job application when you are finished with school. All the best to you and your family,” Sundar Pichai wrote. Andy Bridgewater shared Sundar Pichai’s response on LinkedIn, and said that “it’s a much-needed confidence booster for Chloe, who was knocked down by a car years ago.” He said that he would encourage Chloe to develop her skills and focus on her studies to fulfill her goal of working at Google in the future. Next › Fujifilm X-Pro2 vs Leica M: Imitation is the Highest Form of Flattery?